NEW YORK (CNS) — Peace is a gift from God and not an imposition, a Colombian archbishop told those gathered for a Sept. 17 prayer service on the eve of the opening of the 73rd session of the U.N. General Assembly. Accepting it is a sign of wisdom, Archbishop Luis Castro Quiroga of Tunja said, adding that real peace cannot be imposed by force, but requires sincere, truthful dialogue and hard work. He offered reflections from his experience with the protracted peace process in Colombia in which the Catholic Church played a significant role. During the four-year effort that culminated in 2016, he was the president of the Colombian bishops’ conference. The talks ended 52 years of armed conflict between the Colombian government and the Revolutionary Armed Forces of Colombia, known as FARC. Archbishop Castro and the other speakers at the prayer service said the complex path to peace is well served by recognizing the humanity of all those affected. “Peace can be as fragile as life itself,” Archbishop Castro said. It must be nourished with the same concern and level of dedication that parents should provide for their children, he said. Peace expresses itself in defense of the life of the vulnerable and such a defense “is a revolt against selfishness, greed, injustice or against anything that may harm human beings,” he said. “Peacebuilding has three elements: an ethical foundation of honesty, free from corruption; a spiritual foundation of forgiveness and reconciliation; and a cultural foundation to encourage a fraternity and a true ‘culture of life,'” he said. Ultimately, people who see one another not as animals, but as humans and brothers, will be able to unite in peace and fraternity, he said. U.N. Secretary-General Antonio Guterres said this is a time of rising intolerance and scapegoating of the vulnerable, where conflicts grind on without resolution and humanitarian suffering deepens. Guterres said the presence of Archbishop Castro at the prayer service sent a powerful message that peace is possible and war is not inevitable. “The archbishop was part of a momentous achievement. He showed us that with leadership and with the ability to meet the other side both physically and in spirit, old animosities can be overcome, and societies can gain a new beginning,” he said. Achieving peace in Colombia is profoundly meaningful and “has instilled hope in others caught up in crisis and conflict” and should inspire diplomats, mediators and global citizens to do more for peace, Guterres said. Migrants are the target of frustration and anger for seeking the peace and security that all people want, she said. “We should not see migration as a problem. With goodwill, honest discussion and engagement, communities that feel threatened by migrants can fully appreciate that rather than taking away from the nationals of host countries, migrants bring enormous positive benefits to them and their societies,” Garces said. Migration driven by suffering and violence is symptomatic of the collective responsibility to find solutions that prevent conflict, she said. 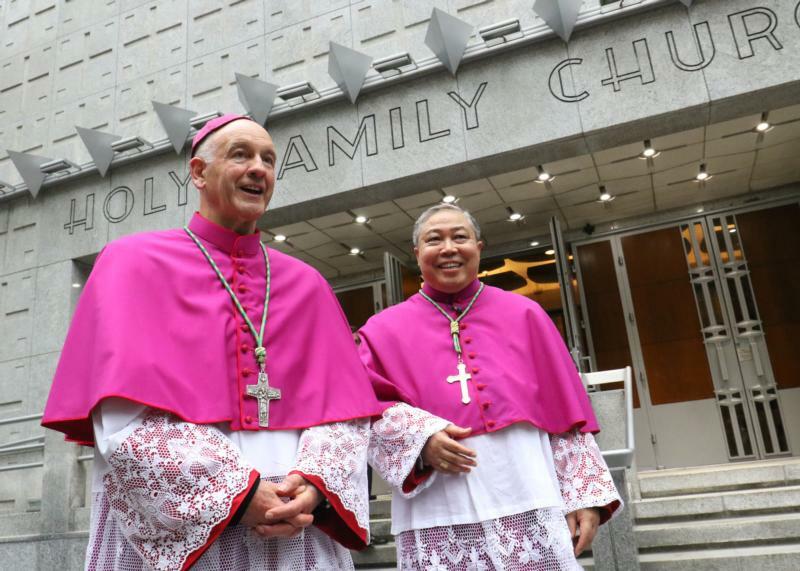 Archbishop Bernardito Auza, papal nuncio to the U.N., presided at the event and welcomed clergy, diplomats, parishioners and staff from nearby U.N. headquarters. The annual interreligious service has been sponsored since 1987 by the Vatican’s Permanent Observer Mission to the United Nations, the Archdiocese of New York, and the Church of the Holy Family, the self-described “United Nations Parish” where it was held. Specific prayers at the service were offered for peace, the earth, refugees and migrants. They were drawn from texts and prayers of Pope Francis. Prayers of petition were offered in five languages. Debra and Marc Tice attended the prayer service and spoke to Catholic News Service. The Catholic couple from Houston was in New York to call attention to the ongoing detention of their son, Austin. The 37-year-old graduate of Georgetown University and student at Georgetown Law School is an award-winning freelance photojournalist. Tice, a U.S. Marine Corps veteran, was detained in Syria Aug. 14, 2012, at the end of a reporting trip. His parents continue to urge the governments of the United States and Syria to resolve humanitarian issues and effect his release. The Tices have advocated relentlessly through many channels for their son’s freedom. Debra told CNS, “The most important thing is prayer” and said she and her husband have been buoyed by assurances of prayer from people on six continents. “It affirms the theme, ‘He has the whole world in his hands,'” she said.